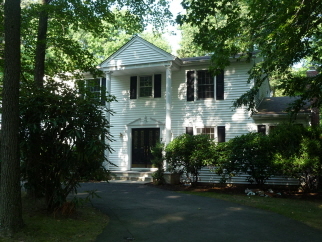 Large Colonial on the South Side of Town Situated on a Professionally Landscaped Oversize Wooded Lot. Eat In Kitchen, Large Family Room with Wood Burning Fireplace.Formal Living Room, Formal Ding Room. Foyer with open staircase leads to second floor offering Five Bedrooms, Main Bath and Study.